Lock in a great price for Modessa Island Resort – rated 8.3 by recent guests! beautiful place ,everything is basic but it’ok .very natural. Everything. Extra kudos to the dive shop with all the fun things you could want for rental. This place is beautiful! From the moment you arrive on the island you can feel the stress falling right off your shoulders as this place is so relaxed. The cottages are right on the beach, only 10 meters from the sea. Furthermore they offer two hammocks and two beach stretchers per accommodation on which you can chill all day long! The food is also very good and there is plenty of choice. There is also a dive center which offers courses, fun dives and discovery dives for reasonable prices. If you don't care for diving, they offer snorkeling gear as well. The water is so clear, you can even see the baby black tip reef sharks (which are harmless) just from standing on the beach. Fantastic place - will 100% be heading back! The staff are very friendly and helpful, and the food was amazing. I was here for my birthday and the team - especially Marko - made sure that I had the best day possible which I really appreciated. Keep up to the great work guys! We spent a great time on the island, which we reached with a boat early in the morning. There isn't a huge variety of food and drinks but even though it was really tasty. The coffee is all the time even it was a soluble one. The bathroom works with a salty water and time to time there is a electricity arrange. There wasn't Wi-fi these few days. The staff is really friendly and helpful all the time. A lot of activities to do - diving, snorkeling, stand up paddling, volleyball, etc. Very peaceful, beautiful and relaxing place to stay, I highly recomend it if you wanna rest. Modessa Island Resort This rating is a reflection of how the property compares to the industry standard when it comes to price, facilities and services available. It's based on a self-evaluation by the property. Use this rating to help choose your stay! Nestled in the private island of Modessa, the beachfront resort features a private beach area where guests can enjoy activities such as diving and snorkeling. Featuring a balcony with spectacular views of the sea, cottages are fitted with a fan and wooden flooring. A wardrobe and seating area are also included. Private bathrooms have shower facilities and come with towels. Beach loungers are also available in front of cottages offering perfect views of the beach. The resort has a bar and a restaurant that serves local and International dishes as well as seafood favorites. Guests may also enjoy their drinks by the beach while lounging and sun bathing. Besides water sport activities, guests can enjoy a game of billiard or have a pampering massage. Modessa Island Resort can also assist with laundry and ironing services. Shuttle service can also be arranged at additional charges. Modessa Resort is an hour’s drive to Barton Beach and Puerto Princesa International Airport is a 2-hour drive and 30-minute boat ride. This property also has one of the top-rated locations in Roxas! Guests are happier about it compared to other properties in the area. This property is also rated for the best value in Roxas! Guests are getting more for their money when compared to other properties in this city. When would you like to stay at Modessa Island Resort? Featuring a balcony with views of the sea and outdoor furniture, this cottage with wooden flooring is a fan-cooled room equipped with a mosquito net. The room comes with a wardrobe and a seating area and the private bathroom have shower facility and towels. 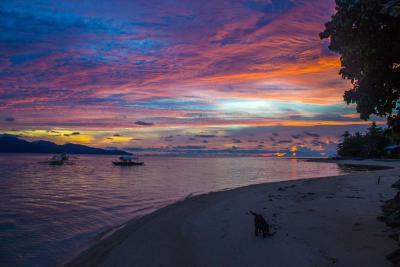 Modessa Island Resort is a piece of paradise located off the coast of Roxas, Palawan, Philippines. Palawan is considered the "last frontier" of the Philippines and is most recently named the "The Top Island in the World" by Conde Nast Traveler's Reader Choice Awards. The beautiful clear blue water and gorgeous weather in Modessa Island Resort makes it feel like heaven in disguise, for those ridding the stresses of everyday living. There, you will find an abundant amount of coconut trees, underwater wildlife and experience peace and serenity like no other. Modessa Island is also known as Reef Island. 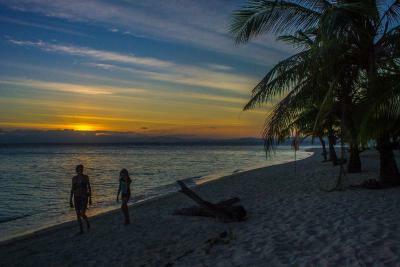 It boasts some of the best corals and reefs in the Philippines. With activities available such as scuba diving, snorkeling, fishing and kayaking, it's an ideal place to unwind and appreciate nature's true beauty. House Rules Modessa Island Resort takes special requests – add in the next step! WiFi is available in the dining area from 18:00 - 08:00 only. Please inform Modessa Island Resort of your expected arrival time in advance. You can use the Special Requests box when booking, or contact the property directly using the contact details in your confirmation. The wireless didn't really work, but the staff helped us to get a SIM card! Don't expect too much from the cottages - remember, this is an Island resort, not a five star hotel! Probably the most beautiful place that he have seen in Palawan. Snorkeling was awesome, the food was very good and the staff did their best to make our trip nothing but beautiful. Special probs go out to Marko - that man is just unbelievable. If we needed anything , he made sure we got it, so thank you kuyaaa! Dirty, uncleaned room. Bathroom mirror was filthy. No electricity during the day so there was no fan to cool us down. Sea water shower that barely worked. All inclusive meal involved pointing to one item only on a card and there was a very limited choice. Staff were noisy. Lots of construction going on, with building materials lying round. The furniture outside our room was broken so there was nowhere to sit. Stray cats were living under our cottage. The floor of the cottage was widely spaced bamboo slats. Several items fell through and could not be retrieved. Can be more clean in the bathroom and need a renovation in bathroom. Plastic chairs in bungalow better change to bamboo or wood chairs for natural feeling - close to nature. Island is very beautiful and good snorkeling. Good food. Some of the cottages are not in the good shape. Especially the bathroom. The place is awesome! And the employees are very good as well. The running water is all salt and it got a bit uncomfortable after about a week there. The employees were very helpful and they provided personable service. Special thanks to Marco for going above and beyond with high quality costumer service. The bar staff was also very helpful. The meals were pleasant and well organized and they had a decent amount of food options. The bar was stocked well. Crystal clear water and white sand beaches, what more can you ask for. There is only salty water in the shower. Meals are good, but if you are more than 2 nights, they start to repeat. Electric power is only from generator (from 6 PM to 8 AM), not from the solar panels. Internet connection did not work, GSM signal is very poor, just for SMS. 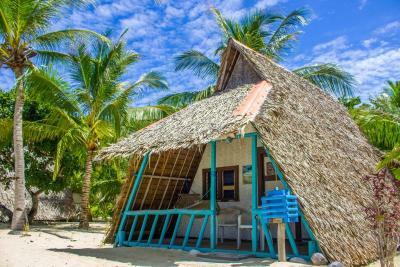 Small "resort" on private island ca 45 min traveling by boat from Roxas. They have their own boat leaving at 8 AM and 1 PM from Modessa and 9AM and 2 PM from Roxas pier. If you want to go ther by your own, you can hire a boat from Roxas for 3000 PHP (60 USD). You can snorkel or dive at one side of the island, the rest is very shallow, just for swiming (or rather laying in the water :-). The beach on the oposite to the restaurant is totally without any people. The whole island you can walk around in 20 minutes. The chalets are very basic equipped, but it is not any problem. The staff is very friendly and helpful. - The staff is nice but amateurish, feels like the place is run by children-staff. - The rooms/bungalows has basically no furniture or lightning, and are not really well cleaned. - I had to repair the toilet with a string because it would'nt flush. - The kitchen has no ambition, and the buffet-food is gone within seconds if you don't stand first in line. The location is really magic. 45 minute boat-ride from Roxas and you will be welcomed by a paradise. There is nothing to do but to swim, to snorkel, sun bathe or have a beer. There was a rat living in the cottage and some ants, but one can expect that when living in the nature and simple bamboo cottage (like a tent). Snorkeling was wonderful, amazing. Reef was reachable by swimming 1-2 mins from beach. The staff was also excellent, friendly and willing to show you all possibilities available on the island. 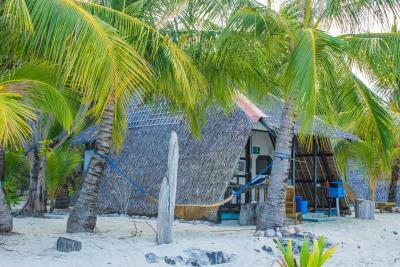 Each cottage is few meters from the sea and has basically private beach with sun beds and hammocks. This place is definitely recommended. Make sure to book enough nights, for us 4 nights was too few. This place is very calm, relaxing, far away from annoying karaoke tourist crowded places. This place is amazing! Such a piece of paradise. The staff were extremely lovely and accommodating and made the first stop on our Honeymoon absolutely excellent. Where to begin. An absolute nightmare. We arrived at 5 o’clock and wanted to leave by 5:30... We had planned two nights on the island and instead opted out for only one. Also, we (up to this point) have stayed in 11 hotels/resorts/B&Bs in the Philippines. This was the second most expensive place where we stayed and it was by far the worst experience ever. - The island was dirty - The room was dirty - Everything seemed to have been abandoned - Trash everywhere - Nothing worked (broken fans, lights, floor boards etc...) - The staff was not professional at all. - Food was terrible - Nothing was hygienic It’s not possible that a structure like that is meant to host tourists on such a pricey bill. Me and my wife are able to ‘rough it out’ but this was too much, I had to sleep the night out on the hammock, to try and escape the heat of the room. The only positive thing was the location and the water. Hire a new cook!!!! Really old huts on beach Salt water showers! The staff is making the difference.